The plug assembly screws into the access fitting body and seals the bore of the fitting to contain line pressure. 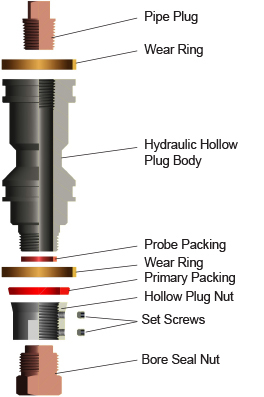 Hollow plugs are used to mount corrosion monitoring devices that require wired connections: Electrical Resistance (ER), Linear Polarization Resistance (LPR) probes, and multiple specialized probes. Contact Metal Samples Company for pricing and availablility.